Legislators voted this spring not only to let doctors prescribe cannabis oil for a wider variety of medical conditions, but to set up a state-sanctioned system for growing and dispensing it. 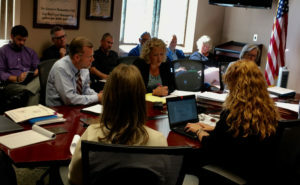 Sarah Reisetter, the deputy director of the Iowa Department of Public Health, briefed the board on its duties. “We do have a lot of work to do in a very short timeline,” she said. The board will meet again on September 22 to review the guidelines that agency staffers have developed for choosing up to two “manufacturers” of medical marijuana. The advisory board will meet three more times yet this year to review the department’s plans for rolling out the state’s distribution system for medical marijuana. The group cannot meet more than four times a year. Iowans may petition the advisory board to recommend that other cannabis products be made available to patients. The Iowa Board of Medicine, however, would make the final decision on any expansion in the “form and quantity” of medical marijuana that’s legally dispensed in Iowa.